This is a funny story about a shopping district called Usagiyama, about a daughter of mochi shop owner, and about a talking bird. Usagiyama Shopping District is a lively place filled with nice people. Our main heroine, Tamako, is a cheerful girl loves to make mochi. She lives with her father, her grandfather and a little sister. Just right accross, their neighbor is also a mochi shop. A competitor, or sort of. And the neighbor’s son, Mochizou, is having a crush on Tamako. The story starts when one day Tamako meets a talking bird named Dera. More than just having the ability to talk, this bird is surely unique as an anime character: an overconfident bird. Dera is a member of royal family in a kingdom somewhere, now looking for a bride for a prince, his master. After tasting some delicious mochi, Dera decides to stay a bit longer with Tamako and become a new member of the neighborhood. 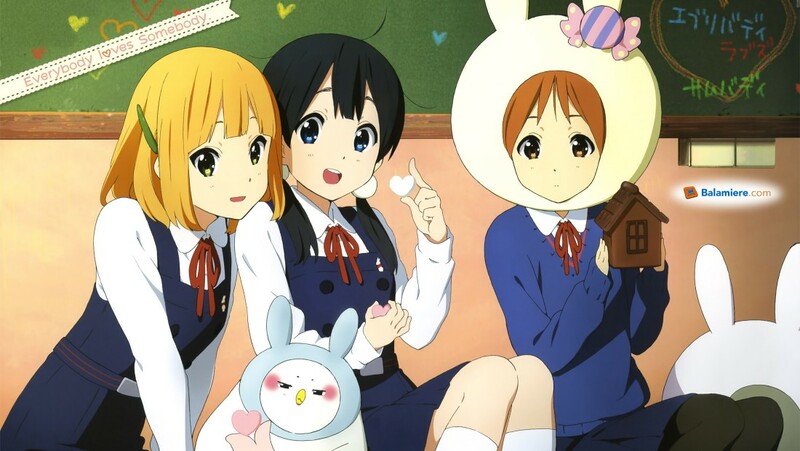 While most anime stories are taken from game, light novel or manga, Tamako Market is an original story. Coming from my favorite KyoAni, this title does not disappoint. Each episode is entertaining and the jokes are actually funny. Recommended for all ages.